Whether you dad is a fishing aficionado or a totally new to the activity, he will no doubt enjoy the unique fun and experience of Miami Deep Sea Fishing about The THERAPY-IV. What better way to show your love and appreciation of dad than with one of our generous and flexible gift cards? 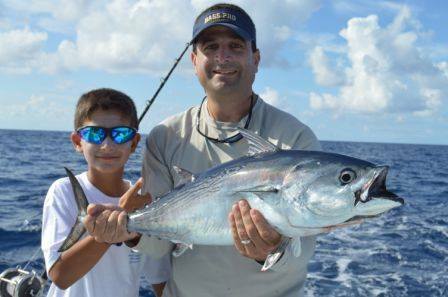 Our state-of-the-art Miami Beach Deep Sea Fishing Charter Boat can accommodate both private and public trips. So if you want some personal bonding time, or plan to throw dad a party, we got you covered ($180 per person or $750 for private party). If your dad loves to fish, he certainly won't be disappointed: The THERAPY-IV is decked out in the latest cutting-edge fishing equipment, including large, a huge flying bridge with a captain’s chair and two fighting chairs, a fishing cockpit outfitted with four fighting chairs, two giant live bait tanks, and a giant transom door. With the help of our experienced and friendly crew, you and dad can reel in all sorts of great catches, ranging from dolphins to marlins, to name but a few! Otherwise, you can take in the gorgeous weather and fantastic ocean view, or enjoy all the amenities The THERAPY-IV has to offer: an air conditioned lounge, bar, indoor theater with stereo and satellite radio, bathroom with shower, fridge and freezer, and much more. Father’s Day aboard The THERAPY-IV is sure to be memorable. Pay a visit to our Miami Beach Deep Sea Fishing Charter Boat, or contact 305-945-1578 or info@therapy4.com. American Pharoah Wins The Belmont Stakes!